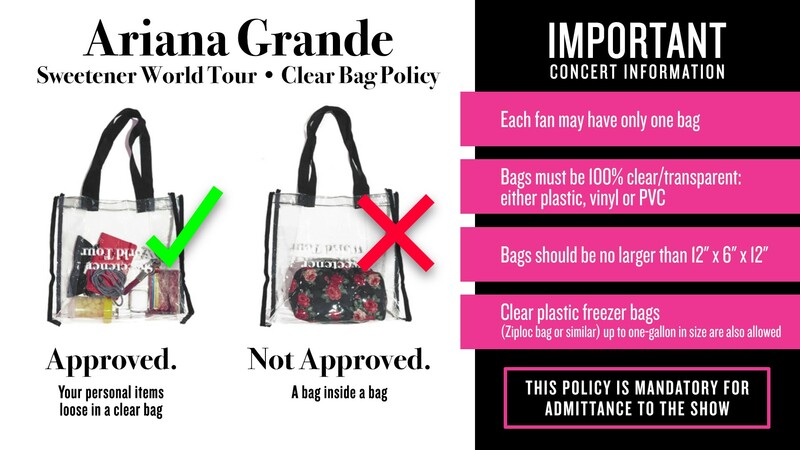 If you’re heading to see Ariana Grande on April 25 at Rogers Place, please note there is a mandatory CLEAR BAG POLICY in effect. You are welcome and encouraged to bring your own clear bags for your belongings. Official Sweetener World Tour bag options are also available for purchase at shop.arianagrande.com. If you have any questions about the clear bag policy please contact info@rogersplace.com or 780-414-LIVE (5483). What are the clear bag policy restrictions? Can I put my purse in the clear bag? Can I check my purse/bag on site? Can I have my wristlet inside my clear bag or a tiny wallet or card holder? What are medically necessary items I can bring? 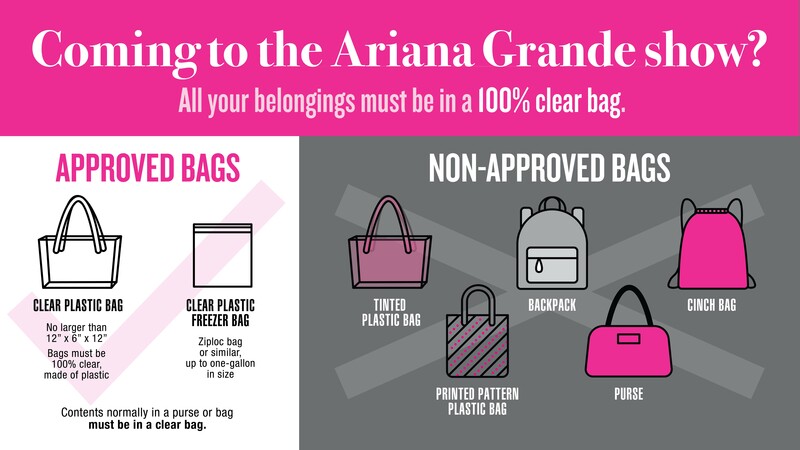 Are you selling Ariana Grande’s clear bags at Rogers Place? Can I bring cell phone to the concert and take pictures or videos? Can I bring a portable charger? Can we bring signs to the show? You can buy clear, venue approved bags at shop.arianagrande.com. Be sure to place your order in advance in order to receive it for the event date. You can also use a one-gallon clear plastic freezer bag (Ziploc bag or similar). Alternatively, you can buy a clear bag elsewhere, however the bag must not exceed 12″ x 6″ x 12″. No, all belongings must be individually placed in your clear bag. Items cannot be placed in additional bags within your clear bag. No, there will be no check-in on site to store your purse/bag. Wristlets will not be allowed into the venue, even in the approved clear bags. Wallets are permitted. To inquire about medically necessary items, please email info@rogersplace.com or call 780-414-LIVE (5483). Official Sweetener World Tour bags will not be available for purchase inside the venue. Yes, you can bring your cell phone. Pictures and videos with your cell phone are allowed. You are not allowed to bring a camera or other recording devices. No iPads or tablets will be allowed. Yes, portable chargers are allowed in Rogers Place. No, signs of any size are not permitted. If you have additional questions, please email info@rogersplace.com or call 780-414-LIVE (5483). Looking for information on transportation, parking, concourse maps and more? Download the official Rogers Place App from the App Store or Google Play. Plan ahead to avoid spending time looking for a parking spot with Parking Panda. Reserve your parking stall today! More info on getting to Rogers Place HERE. 101 St at 102 Ave will be reduced to one lane each direction for utility relocates related to the Valley Line LRT. Traffic delays in this area are expected during scheduled events at Rogers Place. Please allow additional travel time and utilize detours on 97 St, 100 St, or 105 St.
For all Rogers Place venue information, including security, food & beverage, parking, pick-up/drop-off options, camera policy, etc., please review our A-Z Guide. Please see Drop-Off Zones/Designated Pick-Up Areasfor more information. Please see Assisted Listening Devices section for more information. Whether you plan to take the LRT, bus, drive or walk, find the best routes to Rogers Place here: RogersPlace.com/getting-to-rogers-place/. The Downtown location makes Rogers Place easily accessible by transit, with over 40 bus routes and 5 LRT stations within walking distance from the arena. For more information on transit, visit takeETS.com/Downtown. All prohibited items must be appropriately disposed of prior to entry to Rogers Place being granted.